UPDATE: Corrected data was received from University of Illinois Urbana-Champaign and is discussed at the end. UPDATE: This post has now been updated with the name of a department that has raised salaries, and some analyses kindly sent over by UIC. There is very little information available on how much postdocs are actually paid in the U.S., beyond data on institutional salary policies gathered by the National Postdoctoral Association. Following on from recent discussions about postdoc salaries changing as a result of proposed updates to U.S. Federal labor law, we have gathered data from a selection of institutions through Freedom of Information Requests, asking only for titles and salaries of postdocs, to see if we can identify actual postdoctoral salaries. The aggregate data, and more information, can be found at out “Investigating Postdoc Salaries” Resource. Every day, we will be releasing a discussion of each individual institution or system from which we received data. Today: the University of Illinois. As salaries are paid on the 15th of every month, this meant in theory that no-one should have lost out on salary for that month. At the University of Illinois, we did raise Postdoctoral Research Associate salaries to at the projected FLSA minimum of $47,476 in the fall of 2016. 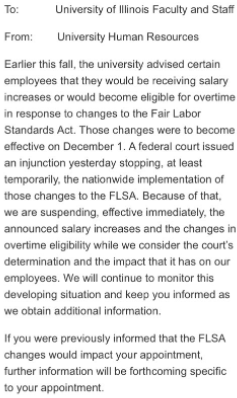 We have maintained those increases even though the FLSA injunction would not have required us to do so. We have now looked at our salary and any NEW Postdoctoral Research Associates must be paid at least $43,000 annually. Units have discretion to pay above the floor if funds are available. However, some postdocs who were being reappointed reported salaries dropping. Potentially, this means by June 2018 (assuming annual reappointments), a downward shift in salaries could occur, depending on individual PIs and departments. A theme that emerged as institutions cancelled salary raises was a clear desire by some departments to go ahead with raises anyway, and this was the case at the University of Illinois Chicago with the department of Microbiology and Immunology. Therefore potential postdocs looking at institutions should look not only at institutional policies, but also departmental and PI practices. There are postdocs in the University of Illinois system who have seen multiple changes to their salary in the space of a year. This is likely to have been a major distraction of postdocs at the University of Illinois from their research. “The annual salaries, as of December 1st, 2016, of all full-time PhD or MD-holding employees who are not considered tenure-track faculty at the University of Illinois institutions. 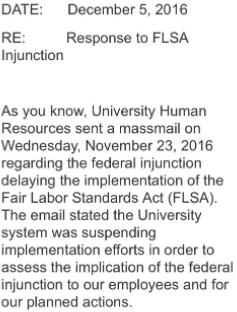 This includes all postdoctoral researchers and fellows, and employees under any other titles that encompass postdoctoral research roles, who would previously have been affected by updates to the Fair Labor Standards Act that were delayed by preliminary injunction on November 22nd. The National Science Foundation’s data on science, engineering and health postdocs suggested UI Chicago would 214 postdocs, and Urbana-Champaign 542. We received data for 18 and 69 postdocs respectively and of those, 10 and 65 (respectively) were above $23,660 and used in our aggregate data. We therefore advise against using this data to draw meaningful conclusions, as there is a high incidence of reporting irregularities and the dataset is incomplete. As a reference, the actual lowest salary at UIC has been communicated to us as being around $30,000. The salary information at University of Illinois is publicly reportable, and raw data for February 2017 is available here, which will be used for our further analysis. A searchable site for salaries here was used by postdoc Joseph Lutz recently to pass along data about University of Illinois Chicago. The most populous bin is the “$50,000” bin (i.e. 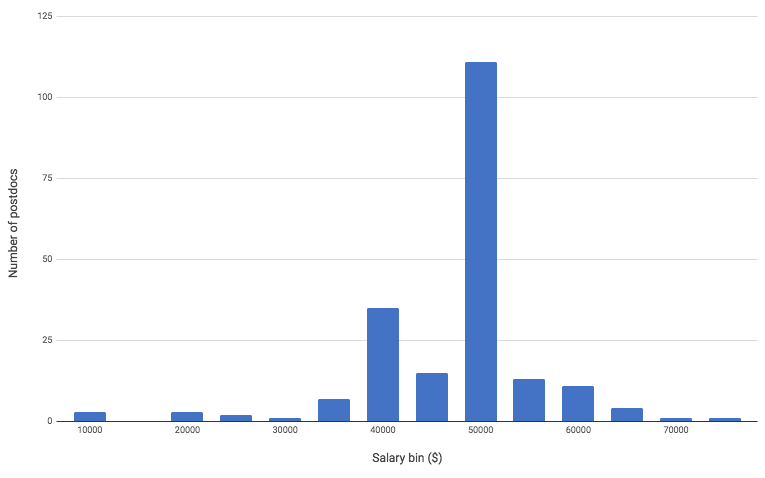 salaries $45,000 to $50,000) reflecting the large number of postdocs at the FLSA minimum in February. This therefore reflects a likely far more accurate picture, albeit at a different timepoint, and again with a number of salaries reported below $30,000 which we believe are not true reflections of actual salaries. Also, this is before the new hire policy change to set salaries at $43,000 in May. It is curious that the data we received would be so different from data that is reported in public documentation, especially as the delay requested in the FOIA request suggests that consultation was undertaken in the institution before providing it. The University of Illinois Chicago does not yet have a postdoctoral office. It would be interesting to consider across our samples whether the degree of institutional investment into support for postdocs is a factor in the ability to easily report out salaries. Using the FY17 data, I removed those below $23K (probably part-timers, since UIC does not permit a postdoc to receive <$30K). From the remaining data (181 persons), I calculated that the FY17 median salary at UIC is $47,476 and the average is $46,490. The calculation for FY16 is a bit lower – Median is $42,000 and mean is $43,381. This aligns with some of the discussion above, and so puts the data on a par with other institutions, particularly the median salary. We have also received data for 2017 which will form part of our forthcoming analysis. We calculated that the cost to University of Illinois Urbana-Champaign of raising all salaries to $47,476 from this November 2016 data would be $1,858,369.74. 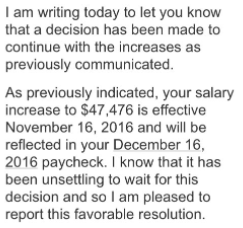 As a post-doc at UIC, I never heard any information “On December 5th, this decision was reversed, and salaries were raised again to $47,476:”. In fact, my salary was never raised to begin with, although a new notification of appointment (NOA) document was produced. I was brought on with a salary below $42K and my salary remained so until fall 2017 when I renegotiated my contract. That being said I think University of Illinois (not-at Chicago) had different policies.